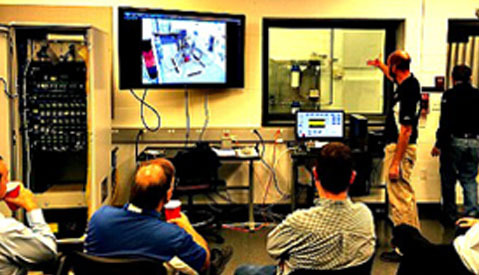 Swift Fuel: Four representatives, including CEO Chris D’Acosta, from Swift Fuel visited Aviation Test Cell and Transportation Education Center (TEC) on Wednesday, September 24, 2014. The visitors arrived by SIU Aircraft at 9:30 AM. Aviation Technologies Chair Burgener and Dr. Rodriguez met with them and spent about an hour in an AVTECH conference room where Swift discussed their needs and how we could help fulfill them. Then the visitors took a guided tour which culminated at the Test Cell. Matt Harrison and Don Bartlett demonstrated the capabilities of the Test Cell by running a Teledyne Continental IO-520 engine. Then they were taken on a tour of the TEC building and met in the upstairs conference room where we provided them a catered lunch. During lunch we continued to discuss Swift’s manufacturing process and Mr. D’Acosta described the characteristics of two of the fuels Swift is marketing, including a 91 octane unleaded aviation gasoline. SI Airport Manager, Gary Shafer, met with the team during the lunch and agreed to put in a tank and purchase a truck load of this 91 octane fuel in preparation for Swift’s national rollout in a few weeks. Gary is positioning SI Airport as one of just a few “early adopters” of unleaded aviation gasoline. This is good to promote the SI Airport using a greener more environmentally friendly fuel. I hope the partnership with Swift will be forthcoming and continuing.